Gold Krill™ is a food supplement containing high-quality krill oil. It is a unique combination of three active substances: omega-3 fatty acid, phospholipids and astaxanthin. Krill oil is a true innovation of recent years among the products intended for heart protection. The discovery of its unusual features was the result of intensive work of a scientific team from different branches of science and medicine. Numerous scientific research has confirmed that the acids EPA and DHA support proper heart functioning. Krill oil combines as many as three innovative substances: Omega−3 fatty acids in a unique form of phospholipid connections, phospholipids and astaxanthin. Fatty acids from the omega-3 belong to the group of polyunsaturated fatty acids. They are described as essential fatty acids (EFA), because they are vital to a proper diet. The results of many clinical studies have shown that taking omega-3 fatty acid has a beneficial effect on the maintenance of the proper functioning of the body. Since it is difficult to provide the appropriate amount of them in food, appropriate supplements should be taken. The supply of these components in our diet is often insufficient, thus supplementing it with products containing omega-3 fatty acids e.g. 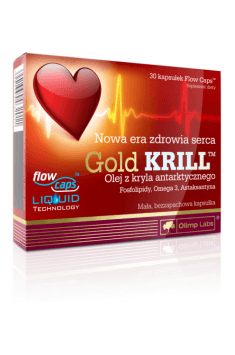 Gold Krill ™, is the best solution. Fatty acid omega-3 (DHA) has a beneficial effect on the cardiovascular system, contributing to proper heart functioning by helping in maintaining normal blood pressure. Along with EPA it controls blood triglyceride levels. DHA acid is used to maintain proper heart rhythm. Omega-3 fatty acids are essential components of high-level brain and nerve tissue. Especially DHA (Docosahexaenoic acid) is important for brain development in the fetus and breast-fed babies (and therefore for its proper functioning). Supplementation with omega-3 is recommended during pregnancy and lactation. DHA (docosahexaenoic acid) is the main component of retinal lipids. It plays an important role in the development of the vision organs in children under 12 months of age. Gold Krill™ is included in the innovative capsule created using the technology Flow Caps™ Liquid Technology. The most advanced liquid technology guarantees maximally quick absorption and high bioavailability of the active components. Hard gelatin overcoat with a patented system for closing prevent oxidizing of the active substances assuring preservation of valuable features and the highest quality of the product and prevent unpleasant smell. Such a solution is a significant breakthrough in the technology of protection of active substances included in the capsules. In traditional soft capsules currently used on the market diffusion channels formulate, through which the components may diffuse on the surface where they are oxidized generating a characteristic unpleasant smell. The technology Flow Caps™ removes this adverse phenomenon almost 100%. Capsules Flow Caps™ have one more important advantage – this is their small and streamlined shape. Thanks to which they are very easy to swallow. 1 capsule a day or otherwise after consulting a doctor. It is recommended to use the preparation every day with the aim of general health prophylaxis and prevention of cardiovascular diseases, arteriosclerosis and cancer.